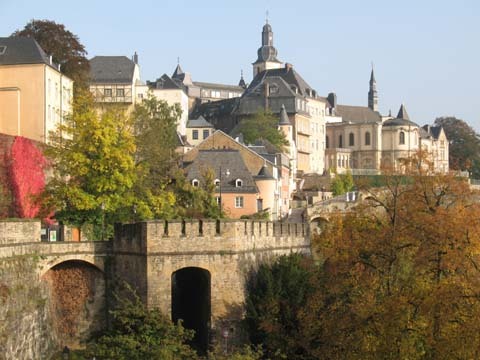 The Grand Duchy of Luxembourg may be one of the world's smallest countries, but it has one of the highest	standards of living and is a heavyweight centre for banking. 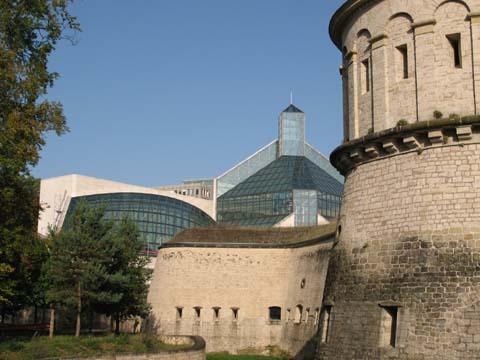 Its capital Luxembourg City is centred	around the heavily fortified Bock rock formation, to which it partly owes its historical survival	sandwiched between the great European powers of France, Germany and the Netherlands. Luxembourg also plays an important role in Europe, it is a founding member of the EU and hosts some of its major organisations. I combined my trip to Luxembourg with my long weekend in Belgium in autumn 2010, and spent one night at the youth hostel in the shadow of the Bock. I found to my delight that my Eurostar ticket was valid to any station in Belgium, so getting to Luxembourg involved buying an extra ticket for only one stop from Arlon, the last Belgian station. I was very impressed with Luxembourg, it has a real "model village" appeal and it's easy to walk the streets for a day and see the sights. I will definitely be back. 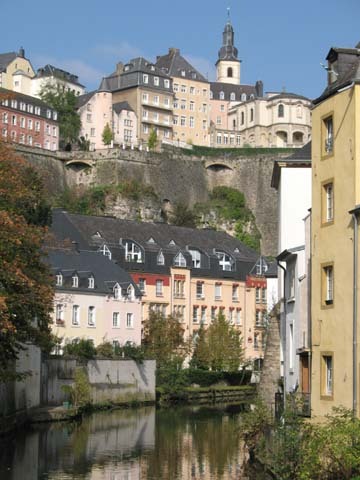 The Grund, the old part of Luxembourg sits at the base of the cliffs of the Bock, along the banks of	the Alzette River. Through the morning fog I could almost have believed I was looking at a model village. Chemin de la Corniche overlooks the Grund, and is known as Europe's Most Beautiful Balcony. It certainly	is very pretty. 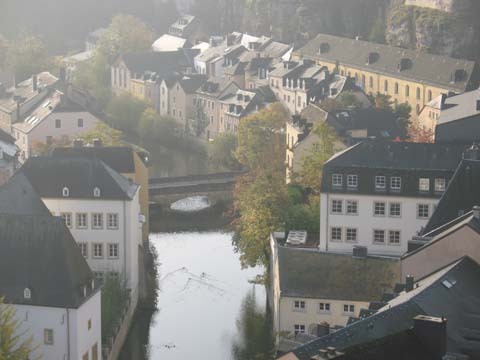 More of the Grund, as seen from the castle Lucilinburhuc on top of the Bock. 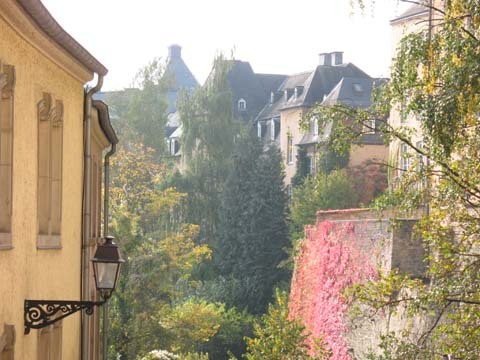 Autumn colours on the chocolate-box houses of the Grund. 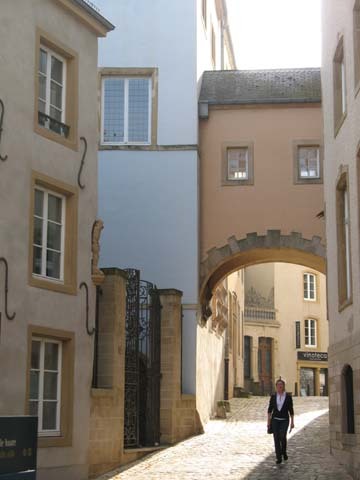 The charming Rue Large runs down from the Chemin de la Corniche to the Alzette River. 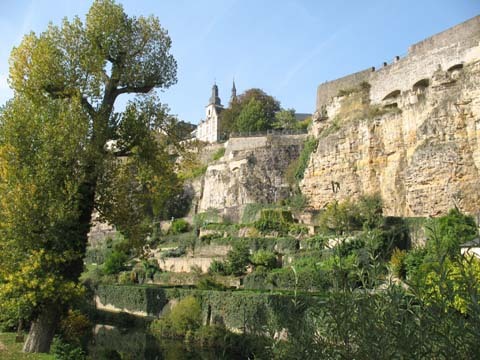 From a caf� down at the banks of the Alzette River, there is a fine view back up the cliff to Luxembourg-ville. The Bock itself is an excellent defensive position, made more so by the kilometres of tunnels which have been carved from within it, known as the casemates. The fortifications stood at full strength until the 1867 Treaty of London, which ordered their partial demolition at the end of the Austro-Prussian war. The well inside the casemates has since run dry. 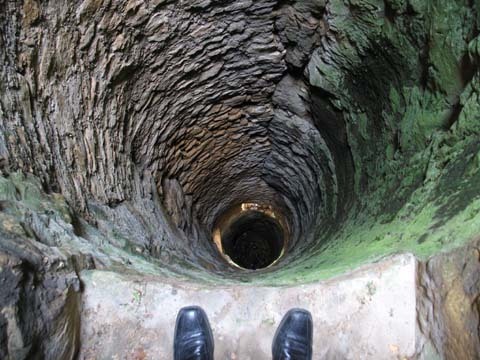 Don't worry, there's a barrier stopping me from falling in. 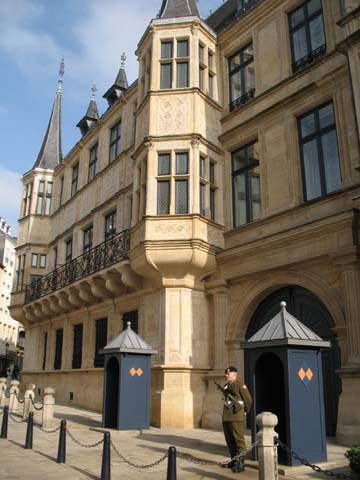 Luxembourg being a small country, it has a small palace, wherein resides the Grand Old Duke and Duchess. 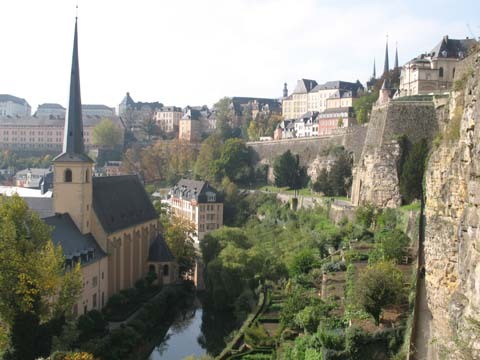 Luxembourg is the world's only remaining Grand Duchy. 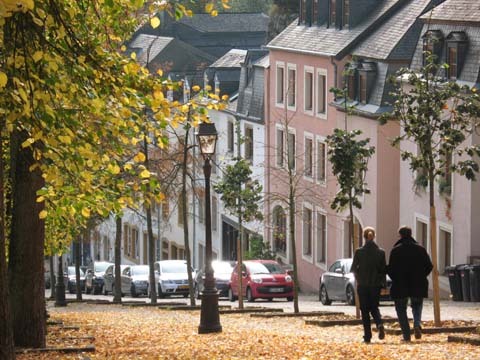 It was very peaceful to wander the quiet streets of Luxembourg City in the autumn sun. 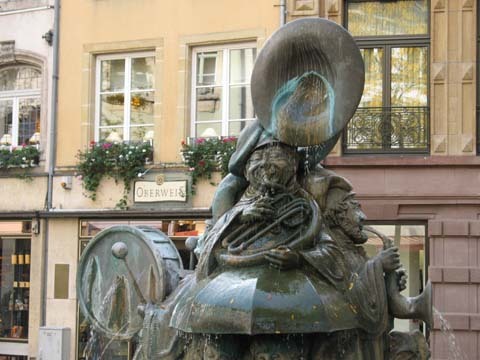 Tuba playing fountain effigy on Luxembourg's Grand Rue. 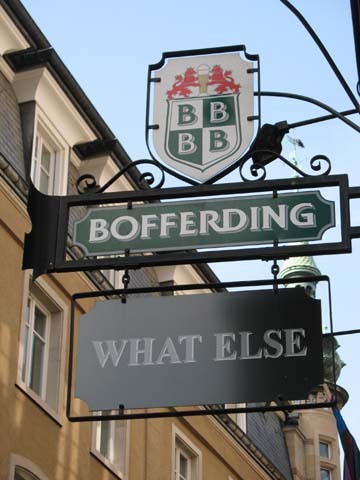 The local brew of Luxembourg is Bofferding - as advertised by this pub - what else? Very refreshing. 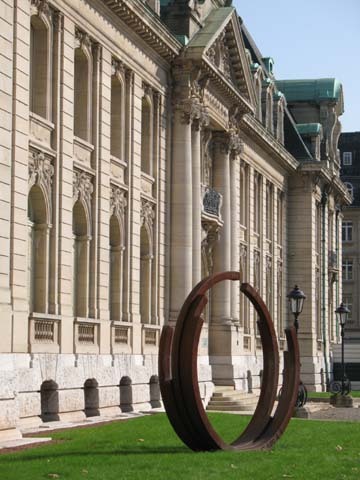 Luxembourg used to have a very productive steel industry, but that has declined since the 1960s to be	replaced by banking and financial services. Nonetheless it retains its steel connections, with the	headquarters of Indian-run ArcelorMittal on Avenue de la Libert�. 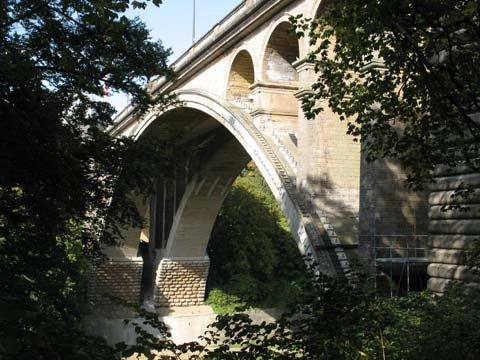 The Pont Adolphe spans the canyon to the south of the city centre, and was the world's longest stone	arch bridge when it opened in 1903. 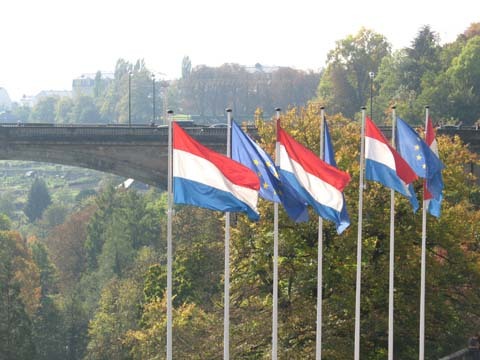 Luxembourgish and European Union flags with the Pont Adolphe in the background. It's clear here just	how slender the centre of the bridge is. 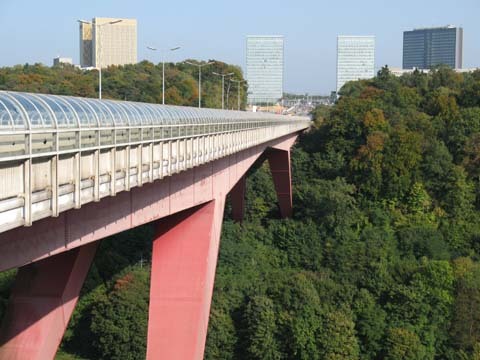 Another of Luxembourg's bridges traverses the Alzette canyon from the city centre to the modern district	of Kirchberg. The Grand Duchess Charlotte Bridge was completed in 1966. 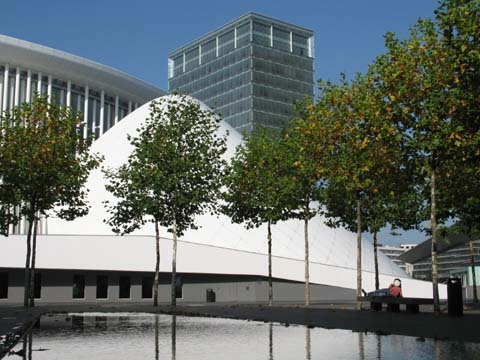 The Philharmonie Luxembourg is the city's concert hall, opened in 2005 its daring design complements	the surrounding modern area of Kirchberg. 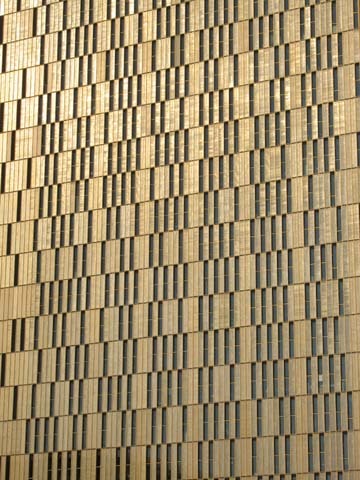 Also to be found in Kirchberg is the European Court of Justice, which reminds me strangely of a fancy	old cigarette holder. I had a real treat when I stopped in at the Mudam, Luxembourg's modern art gallery. It was built as	part of the renovation of Fort Thungen, another of Luxembourg's impressive hillside fortifications. 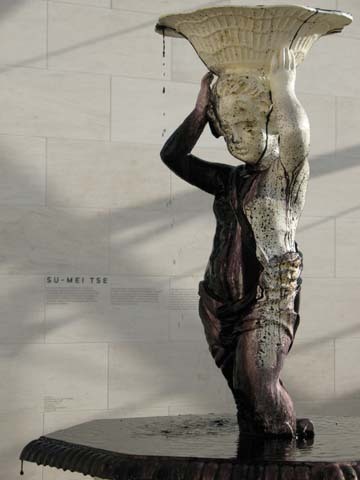 Flowing fountain of ink by local artist Su-Mei Tse. In a darkened part of the gallery it took me a while to realise the purpose behind these seemingly random motorised spinning points of light. 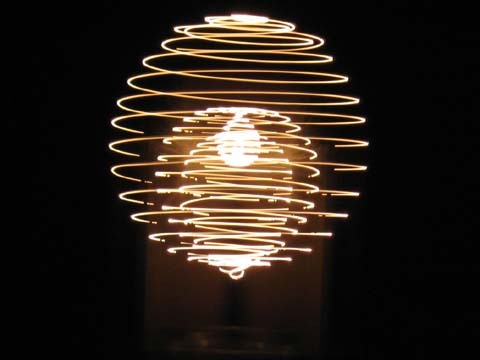 The true picture is only revealed with a long exposure shot, this is the result of 15 seconds of open lens. 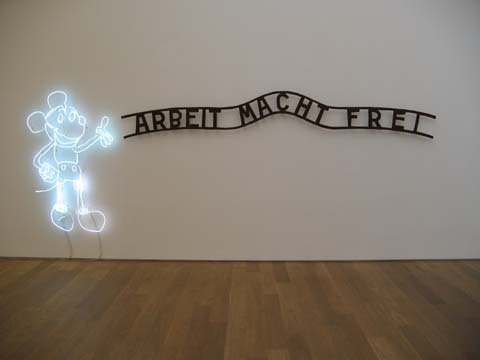 A reproduction of the infamous Arbeit Macht Frei signage which haunts the entrance to Auschwitz concentration camp in Poland. The phrase means "work sets you free". I'm not sure what the point of this exhibit is, as there's certainly nothing Mickey Mouse about it. A view inside the main atrium of the Mudam. 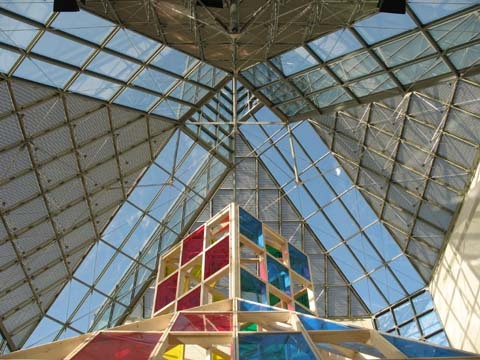 The gallery was designed by IM Pei, of Louvre and Bank of China fame. He is also responsible for Doha's Museum of Islamic Art. Spuerkeess or the Banque et Caisse d'�pargne de l'�tat (no prizes for guessing why I use the short title) is another of Luxembourg's bank headquarters. 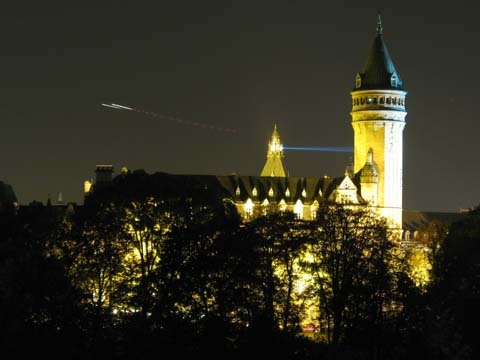 At night there is a searchlight trained from one part of the building to another, and an incoming aircraft has just switched on its landing lights.